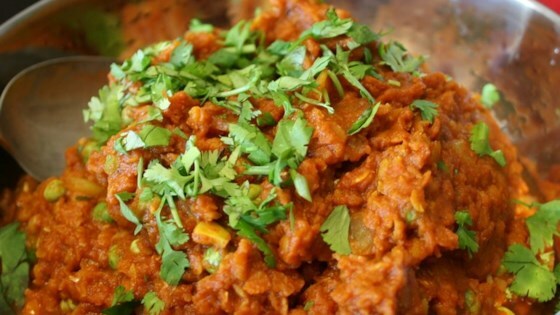 "This is a rich and hearty lentil curry, great as a main meal rather than as a side dish like the more traditional Indian dhal. Don't let the ingredient list faze you, this really is an easy dish to make. This dish is great served with basmati rice." Heat vegetable oil in a large skillet over medium heat; cook and stir onions in hot oil until caramelized, about 20 minutes. Mix curry paste, curry powder, turmeric, cumin, chili powder, salt, sugar, garlic, and ginger together in a large bowl; stir into the onions. Increase heat to high and cook, stirring constantly, until fragrant, 1 to 2 minutes. This was really good! I changed a few things... I didn't have any ginger root or curry paste, so I used 1tb of ginger and 1 (extra) TB of curry, also I added a bit more salt at the end. Quite good. I've found that the red lentils take about 20-25 minutes to cook thoroughly (no pre-soaking, just rinsing) with the lid slightly ajar. I don't usually bother with reviewing, but this was fantastic. I used 1/2 the salt and tomato paste with water. I tossed in good quality frozen green peas to add a little more nutrition.